We at LP Accessible Technologies would like to wish happy Mother’s Day to all the mothers out there. Special thank you to all the mothers that have disable children and are working hard to keep them going. Please know that we love you and we always cherish your hard work and dedication. Introducing Beyond The Chair, the amazing, spectacular, life-changing gym. Beyond The Chair is a non-profit organization founded by Nito Blochlinger and Laura Dominguez-Tauer in 2012. Laura is a C6 quadriplegic and Nito has worked in the adaptive exercise field, specifically spinal cord injury recovery for the past 10 years. 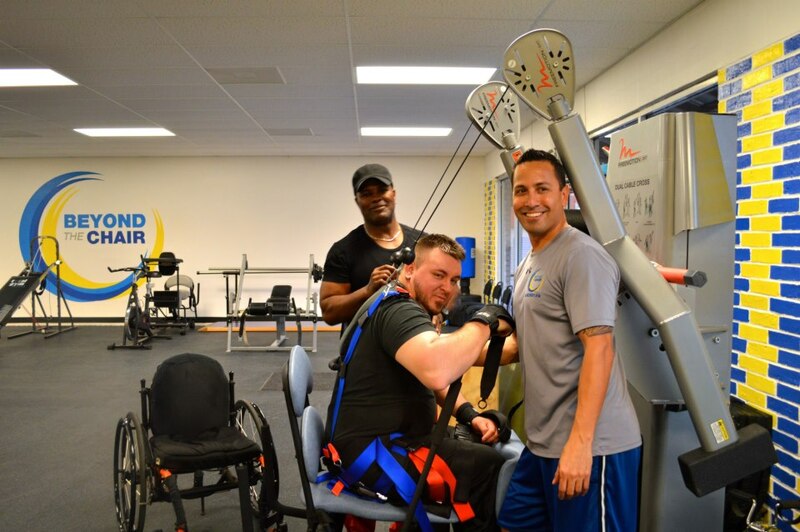 Their mission is simple: to provide an improved quality of life for people with spinal cord injuries and other neurological disabilities through intensive exercise programs. Basically they ROCK!! 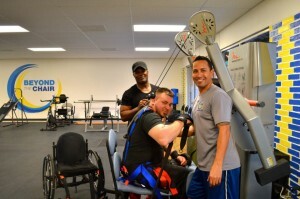 Their Certified Neuro-Fitness Specialists use exercise techniques to train the body in functional movement patterns. The benefits you ask? Got a moment? Or twenty? Lol. Improves circulation, blood pressure, cardiovascular endurance and range of motion. Temperature control, sensations, mobility and ability to function independently. Don’t think of it as just a gym or and occupational/physical therapy. It’s a post rehab program that targets to compliment and improve the clients level of function. It offers specific programs that are designed for each individual and their needs, whether it be training in their gym, or them coming to you. Even group training!! Don’t think they are only specializing in SCI (spinal cord injuries). They also provide services for Traumatic Brain Injury, Post Stroke, Multiple Sclerosis, Muscular Dystrophy, Cerebral Palsy, Parkinson’s, Geriatrics, Spina Bifida, Rett Syndrome, ALS, Fibromyalgia, Amputees, Guillain-Barre, Alzheimer’s and Weight Management. Ummmmm.. MULTI-TALENTED!!! They have the regular machines you would find in a gym and they also have specialized pieces of equipment as well. For instance, they have a motorized elliptical machine that they harness clients into and it’s adapted to produce a movement pattern that mimics a natural gait while in an upright position; helps improve the ambulation of clients. You ready for the Disney success story? They happy ever after? How’s this: Parents of a 4 year old cerebral palsy client of theirs was told their son would never walk in his lifetime. When they first started working with him, he could only take 2-3 steps on his own. Now he is able to walk up to 60 unassisted steps on his own! WHOOOOO HOOOOOOOO!!!! In a nut shell, this place is one-of-a-kind SPECTACULAR!!!! I encourage EVERYONE to check them out, Google them, LIKE them, SHARE them and SUPPORT them!!! They Shall Walk is a non-profit medical research corporation in the state of Washington. It was founded to give the gift of walking, raise awareness of paralyzed and other disAbled persons, improve their quality of life through technology, provide for the needs of mobility impaired, provide educational opportunities for students, teachers, mentors and schools. The next step in the Gift of Walking timeline is the Rehabilitation model of the LIFESUIT called the RehabSUIT. Paralyzed people will use the RehabSUIT to stand, walk and exercise. 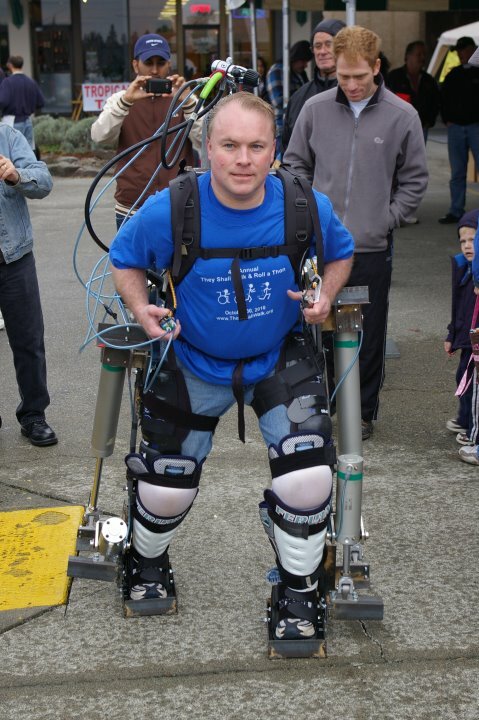 Microsoft has just sponsored in with $1.2 million in software towards the $14 million institute facility in Seattle (AKA the “North Lab”).Automated Therapeutics is the newest sponsor of They Shall Walk and will be manufacturing and selling the therapy version of the robotic suit. 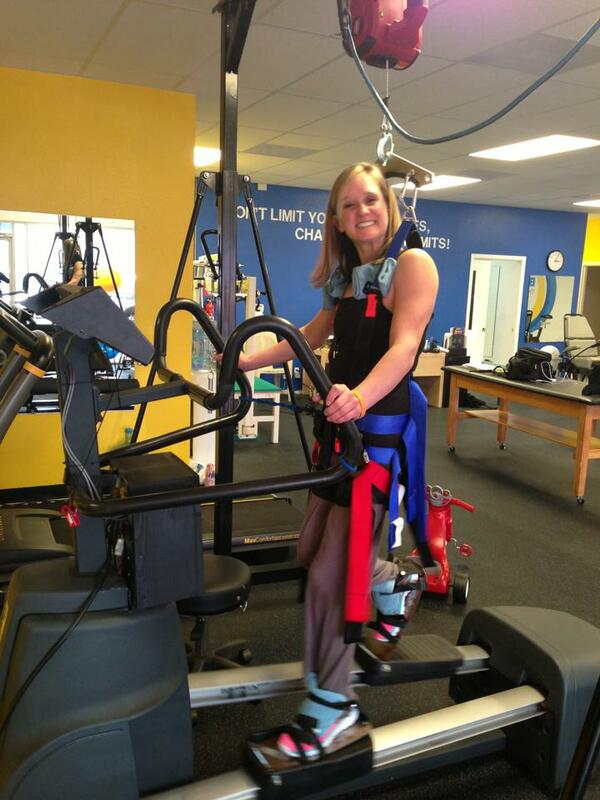 Exoskeletons are now being tested in hospitals with favorable results. Automated Therapeutics will raise $500k to develop the prototype into a market ready product. 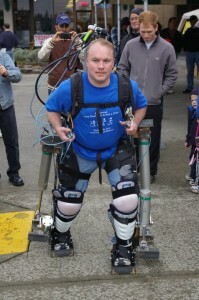 In the future paralyzed people will have a LIFESUIT for use at home and in the office. For instance the LIFESUIT LS14 weighs about 75 pounds and is powered by compressed air. It will allow the wearer walk up to about 2.5 miles per hour and to ascend and descend stairs. The next model, known as LIFESUIT™ LS15 can stand and balance unmanned, it will be controlled in the same way as a powered wheelchair with a joystick. Future generations of the LIFESUIT™ may incorporate a wet-suit style outfit composed of ‘biosynthetic muscle fibers’© ™, fuel cells or “Fuel Pods© ™” and lightweight power paks. It will be worn under the clothes and allow paralyzed to walk and no one will ever know they were paralyzed. There are millions of disabled people that can benefit from the LIFESUIT™ including the SCI, Elderly, Veterans, people with sports injuries, accident victims, and people with congenital defects.